*The local ratings for Monday’s dueling speeches by President Obama and House Speaker John Boehner give some insights about the political mindset of local citizens. I apologize if there are too many numbers, but in this case the numbers paint a political picture of Western New York’s willingness to hear both sides and give each politician equal time. It is difficult to paint an exact picture because TV ratings are measured every 15 minutes and Boehner didn’t start speaking at exactly 9:15. It was closer to 9:17 after a few minutes of network analysis. Channel 2 (the NBC affiliate) scored a first-place 7.0 at 9 p.m. when the Democratic President spoke. The President had the lead-in from NBC’s “America’s Got Talent” to thank. Channel 2 only slipped to a 6.4 rating 9:15 p.m. when Boehner gave the Republican side of the debate. Channel 7 had a 5.4 for the President, which only dropped slightly to a 5.2 for Boehner. The only local broadcast affiliate that had higher ratings for Boehner was Channel 4, which rose from a 3.8 for the President to a 4.1 for Boehner. The cable ratings were even more interesting. CNN, which plays it down the middle politically, finished first here. It had a 2.0 for the President that rose slightly to a 2.2 for Boehner’s response. Fox News viewers, who are heavily Republican, didn’t want to hear the President. It had a 1.0 rating at 9 p.m. which rose to a 1.8 when the Republican speaker spoke. MSNBC, which leans left or liberal, didn’t get enough local viewers to register a rating. 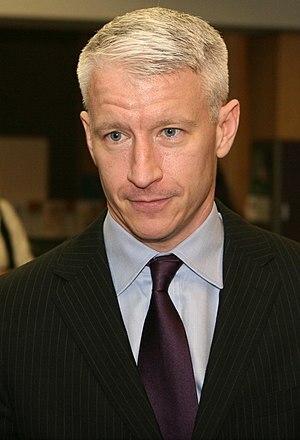 * Channel 4 has finally revealed in promos where it plans to run Anderson Cooper’s new syndicated talk show in September. It will air at 3 p.m. weekdays, with “Dr. Oz” moving to Oprah’s old spot at 4 p.m. as the news lead-in. The loss of Oprah puts Channel 4’s dominance in local news in jeopardy for the first time in years. It wouldn’t be surprising if Channel 2’s “Ellen” out-pointed Dr. Oz as the 5 p.m. news lead-in in the fall. Of course, this item is just an excuse to satisfy one of my readers’ requests and put a picture of Anderson Cooper in my blog. Hope this makes pergysbetterfriend happy. * I’m glad to hear that Cory Monteith (Finn), Lea Michele (Rachel) and Chris Colfer (Kurt) won’t be leaving “Glee” after their characters graduate from high school this coming season. But the initial report that they were leaving the Fox show seemed pretty accurate since it came from executive producer Ryan Murphy. As I said about a week ago, “Glee” never has been about realism so it wouldn’t take much to keep them at school after they graduate. They certainly could appear during sweeps episodes. * Back to the debt ceiling. I picked up the newspaper Tuesday morning after the President Obama and the House Speaker had their prime time point-counterpoint prime time debate and what was the big headline? The NFL lockout was over and football was back, a story that was all over TV on Monday afternoon. The debt ceiling story was on the lower part of Page 1 with a much smaller headline. Now I know football is king around here and people are sick of the debt ceiling debate. But people were sick of the NFL lockout story, too, and it’s a sports story. The way those two stories were treated on the front page seemed way out of whack. * Today’s the final night of the July sweeps, the least important of the four annual ratings periods. I’m told that viewing is way down this July, possibly because of the heat and partly because viewers are tired of the debt ceiling and NFL crises. * If I were President Obama, I’d try to sell the Democratic spin on the debt ceiling crisis by putting a link on the White House website to Bill Maher’s July 8 explanation of the crisis on his HBO show. A few weeks back, Maher explained that he understood why about half the country votes Democratic and why the rich 1 percent of the country votes Republican (so they keep their money). But he doesn’t understand why anyone else is Republican since the party protects the richies at the expense of the lower and middle class. Take a look. It is a classic liberal view that should also serve as an antidote to all the conservative spin that WBEN talk host Sandy Beach is spewing against the President. 4 responses to "Local Viewers Give Dueling Debt Speeches Equal Time"
Leaning a little left are we Al? Hmm. I was saying if I WERE President Obama, I would post a link to Maher. But thanks for keeping me honest as Anderson Cooper would say. Well, one reason you might vote republican even if you weren’t that 1% is because the Republicans would lower your taxes and you’d be able to keep more of that money you earned. Any word on who might replace Regis? I was hoping it would be Anderson but he had already signed on to do his own show by the time Regis announced he was leaving. I hate to see Regis go, I won’t be able to tolerate Kelly Ripa unless Tom Brady ends up being her co-host. ..other than that scenario I will not be watching without Regis.